I've been having a blast these past few days in the first half of the Release to RISE: Blast Off in 2018 Challenge. "I started to melt after third time. So very needed today!!! Went from 9 to 7 to 6 to 3!!!" If you're not signed up, you can still get the assignments and catch the replays of the tapping sessions in the Facebook group. We had an E P I C tapping session on releasing self judgment and tapping into self love and a really great one on releasing the pattern of self sabotage. All the tapping sessions are available for on-demand rewatching. Just use the hashtags "#R2RDay1" (sans quotes) or 2 or 3 to pull up each day's assignment and video. 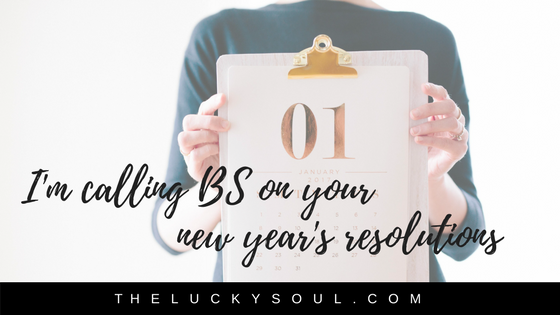 So, today I wanted to call BS on your new year's resolution. It's said that only 8% of people actually keep their resolutions and I want to give you one powerful question that will let you know if you're going to reach yours. If there is, you're not in alignment with what you say you want. How much do you believe it on a scale of zero to 10? 10 being "HELL YES, it practically feels like it's all happening RIGHT NOW" -- and zero being, "Yeah, right. It's a fantasy." Your Lucky Work is to write down all the reasons why you're resistant. Why it won't happen. Why it's just not possible for you. That's going to be your tapping target. It will be so much more effective (and fun!) if you put pen to paper and really dig deep. Join me in the group to tap away your resistance. Newer PostAre you Playing Not to Lose or Playing to Win?